Did you know that California has a 99% chance of experiencing a magnitude 6.7 quake or greater within the next 30 years? The Northridge Earthquake, which hit at 4:31 a.m. on January 17, 1994 was a magnitude 6.7. The quake occurred at a depth of 11.4 miles on an unknown fault, and was followed by thousands of aftershocks. Fifty-seven people died and over 5,000 people were injured during the event. An estimated 1,600 people were hospitalized. The Northridge quake actually took place in Reseda, CA, with property damage occurring more up to 85 miles away. Total property damage has been estimated at more than $20 Billion. It is considered one of the costliest U.S. natural disasters. Structural collapses included the Northridge Meadows apartment complex which killed sixteen people, several commercial buildings and sections of the Santa Monica Freeway, the Antelope Valley Freeway and Interstate 5. Multi-story wood frame buildings suffered the most damage, along with structures made of masonry, constructed on slopes or built over parking areas. The quake also caused hundreds of fires and left tens of thousands of people without utilities for several days. If you are a Southern California home owner, there are many things you can do for earthquake preparedness before the next big quake. Start by making sure furniture and other moveable items are properly secured. Stock up on supplies that may be needed following a quake and organize a disaster plan. You’ll also want to gather and keep important documents in a safe space. You will also want to make sure your home is in good repair and structurally sound. 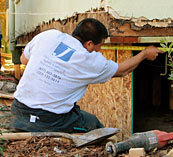 Start by contacting a foundation repair expert and requesting an inspection. A foundation professional will know where to look for damage and potential weaknesses that could put you and your family in danger during an earthquake. Homes that have been built on concrete, especially unreinforced concrete, stone masonry or bricks, are at greater risk for structural failure during a quake. A home can also break away from its foundation if it hasn’t been secured properly. When a house shifts off of its foundation, it can disrupt gas lines, which can lead to fires. Is your home built on a hill? When a house that has been built on a hill isn’t properly supported, it can collapse during a quake. If your home has a crawl space that hasn’t been braced correctly, it could fall during periods of increased seismic activity. A foundation expert or foundation contractor will look at the interior and exterior of your home, including walls, windows, doors, floors, concrete slabs, crawl spaces and basements to determine if there are existing or potential foundation problems, if you need foundation bolting, or foundation repair, etc. You’ll get a post-inspection report and a summary of the issues that need to be addressed. If any repairs are needed, get them done quickly! Foundation damage will only get worse over time. Earthquake retrofitting and foundation bolting will not only give you peace of mind, it can help protect your property during an earthquake and may even save lives.